I was first introduced to scraping the tongue in my yoga teacher training. In India and in Ayurvedic practices, the hand (fingers) are used to scrape the tongue each morning as a kriya (cleansing technique). You can easily use a tongue scraper – an inexpensive yet transformative utensil, is a simple, thin, u-shaped piece of stainless steel. It consists of a blunted edge that removes plaque and build-up from the surface of the tongue. 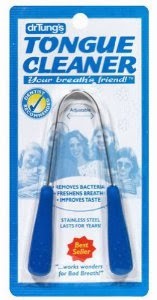 The tongue cleaner also prevents bad breath, especially for people who eat a lot of dairy and build up mucus in the mouth, nose, and throat. I actually use a copper tongue cleaner and LOVE it! And finally, a big advantage is that it enhances kissing because it makes the tongue more sweet, fresh and sensitive. If you are in a relationship, we invite you to check this out with your partner. Make an agreement to scrape twice a day for one week, and notice the difference. Kissie-kissie!!! · Apply a few quick strokes, 2-3 times a day, or after brushing your teeth. · Use the rounded cleaning edge to scrape gently down the tongue several times, while applying slight pressure. · Rinse under running water and gently scrape again until no white residue is left.